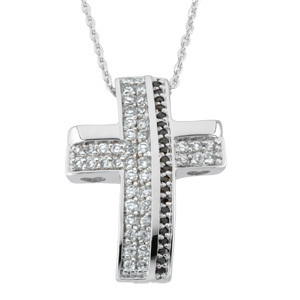 Sterling silver cross contains 21 1.0mm round CZ black gemstones and 42 1.5mm round CZ gemstones. Item size: 26.75mm x 19.75mm. Polished. This item comes with an 18in chain, a gift box, and a card with poem and verse from scripture. From Deborah J. Birdoes' extraordinary Inspirational Blessings Collection of Jewelry.